Someone messaged me on youtube strongly criticizing my methods of training (namely the use of positive reinforcement). They suggested that using treats as a reward is bad because it leads to excessive starvation of the animal and that it is ineffective because the animal will not perform if it isn't hungry or if treats are absent. The person went on to boast that they tamed two, let's just say very small, birds without the use of positive reinforcement at all and suggested I see their videos. Without getting into it too much, basically they exclusively relied on negative reinforcement and flooding. I was shocked that someone would advocate training solely based on forceful means so I want on to write a very long response detailing the merits of positive reinforcement training as well as analyzing different training methods in general. I figured it would be worthwhile to share this answer with my forum members when I realized it turned out so detailed so in my response I asked the person for permission to use their question in conjunction with my response publicly. They absolutely refused and said that I am not allowed to use anything they said or even quote them. So I'm just going to roughly paraphrase what they said merely for the sake of being able to lay out my arguments here for you because I think they are somewhat profound and thorough. When the person responded to my explanation they basically just said that they think I am wrong, that they could write a dissertation justifying their training method, and that they no longer wish to discuss this subject with me. Must have really put a nail in the coffin that they could not provide a single counter argument except that some experts thought their birds were tame. You are mistaken. I understand that you are trying to be nice and sympathetic to the animal, however, you understand little about psychology. Look at people. Most people are starved for something they want. For many, it is not food but other material things they want. This is why they go to work, so they could earn money for food, clothes, house, car, education, computers, etc. Watch someone win the lottery and they quit their job because suddenly they can satisfy all their wants. A parrot wants relatively little. Food is a big one. Social interaction, petting, attention, vocalization, and mating are some others. Many of those (mating for instance) we cannot provide to them as reinforcement. The other things are all subjective and qualitative. Sometimes they want interaction and sometimes they don't. Furthermore, with parrots, they have a natural instinct to flee punishment so it would be impossible to be able to get close enough to a parrot to train it if it is constantly fleeing. That rules out punishment. Negative reinforcement is also very limited as a training tool for animals because (except for a few naturally existing aversives) you have to create an aversive to give yourself an opportunity to remove it. Imagine someone with arachnophobia. So you throw them in a room with spiders so you could be a hero and save them once they do something you want. The problem is (not only that it's unpleasant) is that eventually they'd be cured of the phobia so being saved would no longer be so desirable. Punishment and negative reinforcement wear out very quickly. This only leaves positive reinforcement and extinction as training tools. Extinction doesn't create new behavior so that is out as well. With just positive reinforcement remaining as a training tool, you can only give an animal what it wants in return for what you want from it as a trainer. Toys, attention, talking, petting, etc are only desired on occasion and in small quantities. They are unreliable and not absolute. Food is the only consistent, quantifiable, and continuously desired reward you can give to an animal. You know they want it today and will continue to want it tomorrow. It's the one thing that does not wear off. It may wear off temporarily once the hunger is satisfied, that is certainly true. But in a few hours or by the next day, hunger is guaranteed to come back. Desire for attention, a new toy, some petting, etc can be sporadic. There isn't even a guarantee that it will want any of those from you at all but even if it does, there is no way of knowing when it will want those again. These are completely unreliable for training. As for me, I weigh my parrot daily. Scratch that, I weigh her every time she comes in and out of the cage. I have done this so much that I don't need to weigh her anymore and can guess what weight she is at with reasonable accuracy. I don't weigh her food out anymore, I can tell at a glance how much food to feed her so that she would be at the desired weight come next training session. I have basically found her "empty weight." I never take her down to or below that weight. I take her to just about the point when she is close to empty. Then she is obviously most motivated to "search for food." In the wild this would mean flying to a place where food is available, for you it would mean going to the fridge to get something to eat, to her it means doing cued behaviors. Every living thing does something to make itself available for eating when it needs food. Parrots, dogs, humans, and other social animals are capable of advanced learning and perform complex behaviors that achieve satisfaction of hunger. While dumber animals might only eat the way they know how to eat and no other way, parrots are natural problem solvers and will try whatever it takes to get food out of a complex situation. I just manipulate the "puzzle" to get the food out of as cued trick behaviors. In the wild they might have to chew through a certain type of branch, then twist their beak to get a nut out of a tight hole, then turn it a certain way in their beak, crack it, then catch the nut while dropping the shell, and then chew it up. With me the rules of the game are changed to whatever behavior I am trying to teach. I'm merely adapting the environment so that the parrot would use its food seeking intelligence to performing behaviors that I want to get that food. So instead of foraging in a tree, my parrot knows to lift her foot when told to wave, to say hello when told hello, etc. Basically the concept is completely natural and the behavior is contrived. However, this ability makes them very adaptable and capable of survival in the wild. If a certain tree developed a certain mutation from preventing its seeds to be eaten, you can bet that the parrots would be quick to figure out how to get to them anyway. Meanwhile the specialized birds with beaks evolved for only a certain kind of food might go extinct if they don't evolve the necessary adaptation. However, unlike genetic evolution (which only applies to future generations), learning applies to the existing members of a species as well. Furthermore greater amounts of accumulated knowledge can be passed through learning which cannot be inherited through hereditary means. If parrot A learns to get nut out of a certain tree and no other parrot knows how, they can watch parrot A do that and be able to do it too. Meanwhile parrot B learned to get a fruit from a different kind of treat. Parrot A can learn to eat the fruit, B can learn the nut. Thus both A and B would be capable of having a more varied/available diet. While I am fully aware that I am manipulating the "terms" of the game and making the parrot do cute behaviors rather than forage in a tree, I believe it is triggering the same natural learning mechanisms they use in the wild. In fact, I believe that people who DO NOT train and/or provide foraging challenges for their parrot are damaging their parrot psychologically. In fact, from taking a glance at your videos (and I apologize because I can't have sound at the moment and I only glanced through a few of them, so if i missed something contrary to what I say I apologize in advance) I noticed that you primarily rely on flooding through negative reinforcement. Aside from punishment, this is one of the worst ways to train an animal. The reason the bird does something is because it learns that there is no use putting a fight because you will eventually hold it anyway. It also learns that you are not a threat. However, it doesn't get anything good out of it. It only does it because it doesn't have a choice. On the contrary, when I use food based positive reinforcement, my parrot CHOOSES to do the behavior. She WANTS to do the behavior because there is something in it for her. If she is hungry, she will fly over to me and start doing tricks to get my attention because she knows that doing those behaviors makes food come. For most of my taming and long term "good behavior" so to say, I use alternative methods. For instance I taught my parrot to say "hello" to get my attention rather than screaming. It's about the only thing she knows how to say so I stuck with that. In the evening when she finished her meal she would screech and scream to get my attention to come and cover her for the night. I don't come when she does that but I come when she says hello. So now she says hello to get my attention rather than screaming. This is nice and it works well. However, this isn't a complicated or energy intensive behavior. I challenge you to teach an animal to complete a puzzle NOT for food. I doubt an animal would find it worthwhile (especially the weeks of practice until it starts getting it right) for nothing but attention. You asked if I am tempted to starve my parrot. I am not sure what you would mean by starve so I cannot say in that context. What I can say is that I have established 113g as her most motivated training weight and 110g as completely empty crop weight. I always set my goal to have her at 112-116g for training. When her weight is below 113g, I noticed that she is overly eager to complete behaviors and she doesn't pay enough attention. She will rush the behaviors or do all behaviors just in case rather than paying attention and performing the behavior deliberately. So I try to get her hungry but not too hungry or she does badly. Think of people. When they are hungry, they can think of what they want to eat, prepare it, cook it, etc. Someone who's too hungry will just grab the first thing they can get from the fridge or cupboard that doesn't require cooking and just eat it. I always try to get her to that hungry but thinking rationally stage. I have no interest in making her desperate and it doesn't help the training anyway. The animal will not perform when you run out of other things it wants too. My parrot will often go through 10-30 treats per training session. She might only desire petting/praise/attention for 5 times max. Think of a back massage. You can enjoy one, maybe even two. Getting 10 in a row for 3 hours and you'd hate it. I train right before her meals when her hunger is at its peak. I can train her for up to her entire meal's worth of calories before she is full. I do not do that because I don't want to be training her for hours and because I want her to eat more nutritious foods for her meal. I don't run out of hunger when it comes to training. It's much quicker to run out of non-food reinforcements though. Furthermore, my parrot will still perform behaviors even if she is not seeking food. I may not be able to get the same number of responses or accuracy of responses as when she is hungry but she does offer many of the behaviors (particularly the easy ones) when she isn't even hungry. The difficult behaviors usually require a bit more motivation. Actually no. If you simply wait to train at the time the animal is hungry, then it will work for food. It is a matter of time rather than quantity. The only reason I measure out how much food I have is to get the timing to work every day. If I gave her an unlimited portion, she'd eat enough food to hold her over for 2+ days and that would defeat my goal of daily training. However, if I let her stuff herself one meal, if I wait long enough she'd come back to hungry enough to want to train. No, the clicker is merely meant to serve as a bridge between the behavior and the reinforcement. I go further and use it as a secondary reinforcer. When I click, it's just to tell the parrot that she did what I wanted regardless if she gets food. I wouldn't call those tricks. The bird is just playing and in social species play is a normal way of practicing useful skills, bonding, and performing exploratory behavior. The things that I call tricks in reference to training are consistently reproduce-able learned behaviors that exert energy and that can be triggered by a particular stimulus. This is how I differentiate taming. Taming I would consider to be learned behavior that does not require the animal to exert energy. Allowing itself to be grabbed for instance is a matter of taming. It merely has to NOT resist rather than make an effort to make something happen. If you cannot make the bird do the same behavior in the same manner several times in a row and for different days/sessions, then I would not consider it a trick. Also I would not consider self learned or innate behavior to be a trick. I would only consider a trick to be a natural or unnatural behavior that has an unnatural stimulus that consistently triggers the behavior. Parrots like to stretch their wings (one leg and one wing) once in a while. That is not a trick. If you could invoke it to do that on demand, then I would consider that to be a trick or a "trained behavior." Then you can take it to another level and teach unnatural behaviors with unnatural stimuli like playing dead. The last thing I want to say about food based reinforcement is that it is objective. Anyone can cue my parrot to do a trick and she will do it for them for some food. If I could no longer care for my parrot and someone inherited her today, I am fairly confident that if they would follow my methodology, they would be able to get the parrot to respond to them, come to them, do the tricks, and do everything that she knows. However, non-food based reinforcements are shotty and are unlikely to be reproducible by other people. Can a stranger (to your bird) come to your house and just pick the bird up? I highly doubt that. However, with my parrot, as she is trained to respond to certain cues, can be called by anyone. Strangers can call her name and she will fly and land on their hand for a treat. She does not have to see the treat before hand. She is not being lured onto their hand for food. She is just familiar with the cues and can generalize them to other people. However, by the methods with which you tame your birds, they merely learned to not be scared of you, but that does not necessarily go for other people. Lastly, I use a variable ration of reinforcement schedule so I am able to get my parrot to perform a fair number of behaviors without a reward, merely in anticipation that somewhere along the way one of those behaviors will earn a reward. I can often get her to perform 50 behaviors in a training session for merely 20 treats. I can make that limited hunger span a long way by using an unpredictable reinforcement schedule. As a trainer, you must ask yourself whenever you want the parrot to do something "what's in it for me" from the parrot's perspective. If they have nothing to gain for it, they will not do it. I wrote this long response because you opened a can of worms. You made some implications which I strongly believe to be misguided. 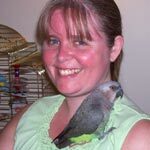 I have read countless books on parrot training, bird anatomy, human and animal psychology, etc. I studied psychology for 4 years in college and am still in contact with a psych professor discussing the implications of operant conditioning and behavioral studies. My vet thinks my parrot is in excellent shape and just the right weight. She is healthy and strong. Her flying gives her good exercise and mobility. I think you are misguided by ignorant assumptions on the basis that "it's not nice" to deprive someone of food rather than thinking about psychology, motivation, and why we do things. We go to work because we need to earn money and not because we love to shovel dirt or answer phone calls. Certainly many people enjoy their work to some extent but the reason they do it is for food (and other human things they want but food as well). My parrot enjoys training and on occasion she will preform her tricks on a completely full crop. However, for the sake of maintaining a repertoire of over 30+ behaviors and continuously teaching hew new ones, food reinforcement is the most effective way of doing this. If you don't mind, I'd like to forward this discussion around to some of my followers and possibly post it on my forum for the benefit of other people seeing my response to your points as well because this is an important question. I won't mention you by name (unless you want). I'm not trying to scold you or make you feel bad by any means. You came on strongly and challenged my (highly contemplated and deliberate) methods so I felt I had to explain them. To close, I wanted to mention that while I do believe that flooding, punishment, and negative reinforcement have a place in parrot training, I absolutely DO NOT think that they should be used as the primary means of training. I'd like to see this person try to work with an aggressive macaw solely by poking it until it steps up rather than boasting about forcefully taming a bird that fits entirely in your hand. You diffentely take the whole topic very seriously and have the experience and knowledge to make such an argument. I just wish that people would respect the fact that everyone has their own opinions and just because it differs from theirs doesn't necessarily make it wrong. I know I am a supporter of positive reinforcement for getting animals to do what you want them to do. I've had several dogs over the years and trained each of them using positive reinforcement. I even did agility training with one of our dogs and that is all about positive reinforcement. It's only been until recently that I started thinking about using the same method of training for my birds. Don't get me wrong, there are times when I do use negative reinforcement, but never in a way that could harm or make an animal uncomfortable. I use it to try and get them to stop an undesirable behavior. For example, Jessie had taken to loosening his food bowl and knocking it onto the floor just to get attention. At first he was smart and I was dumb, because I'd come running every single time and make a fuss while cleaning it up. He even started laughing when I'd come running too - and how can you be mad at him once he starts laughing. Now, no matter how difficult it is for me, I ignore his behaviour and he no longer gets attention when he does it. I go and clean it up when he's distracted and doing something else and I don't make a fuss over it. He is doing it less and less often now because he's no longer getting the desired result. Now he's resorted back to saying 'Come here' when he wants my attention, which works far better for him, because I think its cute and its not loud or annoying. Not even sure if you'd really call that negative reinforcement. You certainly make a good argument for positive reinforcement. At the end of the day, all that should matter to you is that Kili is a happy and healthy bird. Unfortunately, when you post advice or videos on the internet like you do, you're most likely going to encounter someone that doesn't agree with your methods and will try to challenge you. I wouldn't worry about it too much because I can guarantee you that they're not even giving it a second thought. lzver wrote: Don't get me wrong, there are times when I do use negative reinforcement, but never in a way that could harm or make an animal uncomfortable. I use it to try and get them to stop an undesirable behavior. For example, Jessie had taken to loosening his food bowl and knocking it onto the floor just to get attention. At first he was smart and I was dumb, because I'd come running every single time and make a fuss while cleaning it up. He even started laughing when I'd come running too - and how can you be mad at him once he starts laughing. Now, no matter how difficult it is for me, I ignore his behaviour and he no longer gets attention when he does it. I go and clean it up when he's distracted and doing something else and I don't make a fuss over it. He is doing it less and less often now because he's no longer getting the desired result. Now he's resorted back to saying 'Come here' when he wants my attention, which works far better for him, because I think its cute and its not loud or annoying. Not even sure if you'd really call that negative reinforcement. This is not negative reinforcement. Clearly you completely misunderstood the concepts of reinforcement and punishment. You were using positive reinforcement (running in and making a big deal) about the bowl so the behavior continued or increased. This just demonstrates the effectiveness of positive reinforcement. The second thing you described which was ignoring the behavior lead to extinction (due to the lack of punishment or reinforcement). You did not use negative reinforcement at all so I really don't understand why you are advocating excessive use of negative reinforcement. While I agree that positive reinforcement works best for training. I don't agree that something has to be missing. Alex gets all the food and attention that he wants and he is still willing to train a few times a day. Most of the time he likes getting his treat, but he has also trained after pigging out on a snack. He ignores the treat and just works for his Woo-Hoo. While trying to get him to do stuff like turn around is going slow, he is back up to 4 colors. Something has to be missing or unsatisfied. You even demonstrated this in your answer. I never said that good has to be missing although I think it is more effective. Something has to be missing, treats or even Woo-Hoo are something they don't get all day so they are willing to work for them till they satiate. If they got nothing but treats or Woo-Hoos all day long, they wouldn't train for them. In order to have a basis for positive reinforcement there must be a pre-existing condition of depravity. In the wild it happens by default. Birds don't wake up in the morning with a bowl full of food so they have to work for it. At home you either have to take the food away to make it work for it or have something else to offer that it doesn't get at other times and is willing to work for. * Positive Reinforcement -- adding something to increase the occurrence of a behavior; colloquially "reward". Doesn't HAVE to be food. "Good boy!" is positive reinforcement, the question is, is it an effective one. * Negative Reinforcement -- taking something away to increase the occurrence of a behavior. The basis of almost all horse training, some form of "pressure" is applied and removed when the desired behavior occurs. Doesn't need to be painful or overtly unpleasant, the cessation of nagging is a form of negative reinforcement. * Positive Punishment -- adding something to decrease the occurrence of a behavior. Colloquially "punishment" and often confused with negative reinforcement. A negative consequence to a behavior, and it need not be physical or painful. The "wobble correction" for biting is a mild form of punishment. * Negative Punishment -- taking something away to decrease the occurrence of a behavior. Time-outs, turning your back, taking food away, etc. are forms of negative punishment. * Extinction -- doing nothing to let a behavior die out because it gets no reinforcement. * Flooding -- maintaining or repeating a stimulus until reactive behavior dies out because it gets no reinforcement. IMO all animals can be trained using any of the above methods. They all work to some extent. But depending on the type of training being done, the basic social wiring of the species in question and the personality of the individual, some are going to be more effective than others. I approach my cats differently than I approach my conure than I approach my horse. With the bird, extinction and positive reinforcement have been what I have used the most, but I have also used mild punishment with some success ("wobble correction", blowing). Since I've yet to find an effective food reward for him, I've been using praise, attention and head scratches as positive reinforcers. Food is a very effective and immediate reinforcer, but one can do positive reinforcement training without using food. And while I don't think I'd set out to use flooding as a primarily training method, one does typically combine it with some form of reinforcement when teaching an animal to tolerate a procedure such as claw trimming (you don't stop every time a behavior occurs because you don't want to reinforce the behavior, so it becomes a form of flooding). I'll add that I agree with Suzzique something doesn't need to be missing per se... the bird's basic needs may be met without the reinforcer, so it may not need it, but the bird has to want it. For whatever reason. Sometimes a behavior is self-reinforcing because it is fun. You only reiterated what I originally said. I never said other forms cannot be used and if you look at my harness training article, you'll see that I recommended positive reinforcement, negative reinforcement, and flooding. I forget if I mentioned there but I also use punishment. When the parrot starts chewing the harness I tug it to knock her off balance. I don't want her to be scared of the harness but I want her to learn the consequence as an immediate response to chewing it. colloquially "reward". Doesn't HAVE to be food. "Good boy!" is positive reinforcement, the question is, is it an effective one. Actually no. "Good boy" is not and can never be assumed to be positive reinforcement. It is only positive reinforcement if it can be observed to increase the behavior response. Furthermore it is a conditioned (secondary) reinforcer which means that it must be coupled with a primary reinforcer which has some kind of value associated to it. So most people that achieve praise to be rewarding for the parrot have done it by giving praise in conjunction with food treats in the past and eventually the parrot started to accept the praise a secondary reinforcer (because from time to time it leads to the primary one). I challenge anyone to take an untrained parrot and try to train it a behavior solely in response to "Good boy." Secondary reinforcers are convenient and have a place in training, however, it is only the primary ones that can serve as the basis for the training. That rules out punishment. Negative reinforcement is also very limited as a training tool for animals because (except for a few naturally existing aversives) you have to create an aversive to give yourself an opportunity to remove it. And that's partially what I was reacting to. With horses, the "aversive" eventually becomes a cue that is no longer inherently aversive as such. A cue that is held until the behavior occurs is introducing some level of negative reinforcement in most cases, I suspect. It can get complex. I do have to admit guilty as charged" in that I did not read the whole post as carefully as I probably should have due to the length. That's one reason I took so long to respond at all. Actually no. "Good boy" is not and can never be assumed to be positive reinforcement. It is only positive reinforcement if it can be observed to increase the behavior response. I don't know that it can be assumed to be under every circumstance, but I HAVE observed it personally to increase a behavioral response. Obviously in a bird with no experience with humans it is unlikely to have much effect. Also, I'm sure it is not the words per say, but the positive attention that can be inherently reinforcing. Perhaps even the nonverbal component thereof, but nevertheless... We find the antics of parrots to be positively reinforcing for us, don't we? Don't we do some behaviors because our birds seem to like it? Why not vice versa? It's reinforcement via relationship rather than via fundamental biological need, but in most cases when we use food rewards they are treats, not the basic diet and are also an extra not a fundamental need. This is because a very aggressive parrot that hates you will not give a hoot about being called a "good boy" or the attention for that matter. Food is one of the only primary reinforcers you can offer it to tame/train it. This is why I think food proves to be most effective because it is impersonal and quantifiable. I'm not going to argue with that, but that's a specific case. We are getting stuck on either logical constructs or semantics... "Good boy!" can be a positive reinforcer, but it is not always a positive reinforcer for every situation. Food is an effective reinforcer more often, and one can take steps to make it more effective (e.g. let the bird get hungry). Neither of those statements really says anything about positive reinforcement as such. I suppose I could imagine a case of a bird so antagonistic that it would actually starve to death rather than be trained, in which case no effective positive reinforcement ocurred, but that's speculative. I think we are in violent agreement but making the statements differently.